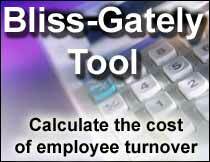 The Bliss-Gately Tool calculates . . . Precisely measure the business costs and impact of employee turnover using Microsoft Excel� spreadsheet technology. Designed for employers of all sizes. 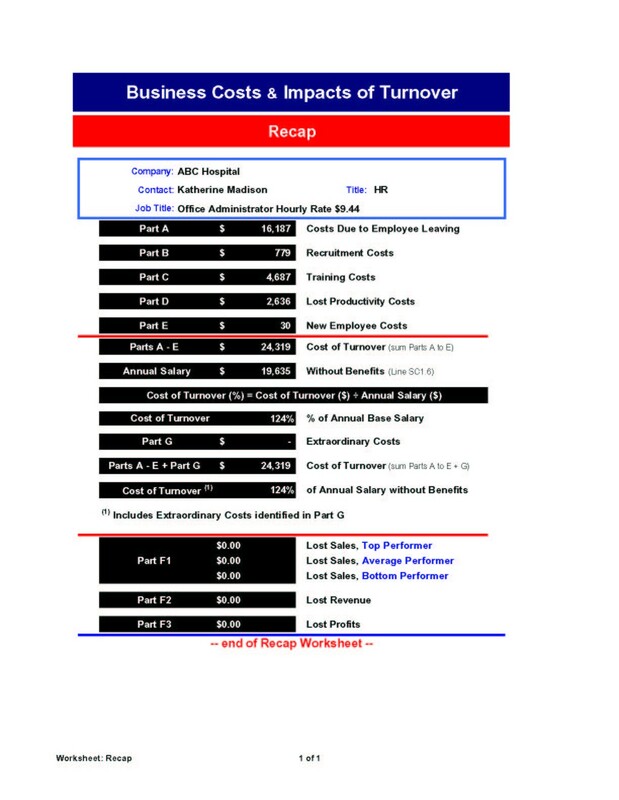 This tool contains over 40 elements to consider when calculating the real dollar cost of employee turnover. Includes all the formulas needed. Simply enter the numbers unique to your own situation and the software will do the rest. Save dozens of hours of manual calculations and countless hours of debate over cost estimates too general to provide substantive value. Using this tool, CEOs, CFOs, and Human Resource executives can completely understand exactly how costly employee turnover is to their company. The Single User License is for use on one computer, the Site License can be used on up to 6 computers at one site and the Corporate License can be used by up to 100 users at multiple locations. See an article by Bill Bliss. IMPORTANT: Netscape Users, click on the Formula Box (white box at the top of the page) to see the file after it has downloaded. Click here to view a Typical Recap Page. Click here to download the Bliss-Gately Tool Owner's Manual. 1 User 249.00 each Call to order. Up to 6 Users at 1 Location 999.00 each Call to order. Up to 100 Users at Multiple Locations 9999.00 each Call to order.